About Dark Hope: For years, Hope Carmichael, survivor of a shocking child abduction, has lived a sheltered existence under the protection of her fanatically religious father. Now, liberated by her mother, Hope prepares to start life over as a normal kid in an Atlanta, Georgia, high school. Normal, that is, until Hope meets Michael, a gorgeous emancipated teen with a mysterious past and a strong interest in her. Soon, Hope's life is filled with questions. What's behind the angry looks she gets from Lucas, leader of a gang of students? Who's responsible for sending Hope strange valentines inscribed with Bible quotations? How does this relate to the sinister business of human tracking that operates on the periphery of Hope's suburban world? And is Michael really a protector, or something more sinister-and just why does he seem so familiar? 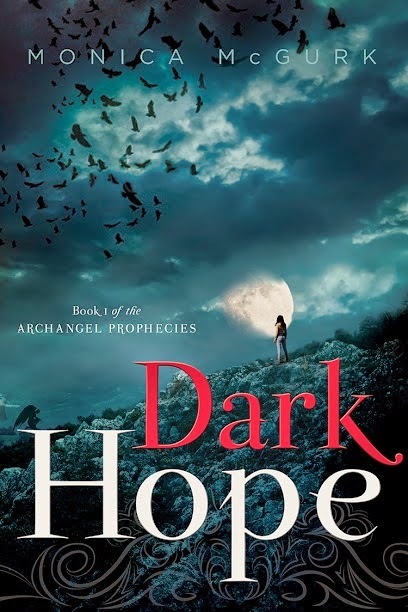 In an epic narrative that takes readers from the back streets of Atlanta to the height of Vegas penthouses and beyond, DARK HOPE introduces The Archangel Prophecies, a saga of extraordinary love, vast mythological scope, and great moral urgency. About the Author: Monica McGurk started out writing fan fiction based on Stephenie Meyer's Twilight Series under the pen name Consultant by Day. She has been recognized for her prequels and alternate versions by her fans, winning the Twific Fandom "Undiscovered Gem" award for Morning Star in 2013. Since her fan fiction days, she has left the consulting firm at which she was a senior partner and remains a full-time business executive based in Atlanta. While this is her first novel of any sort, she has been published in the business press on numerous topics.She is married and the mother of three children, for whom she creates elaborate bedtime stories that sometimes last for over a year. She has already completed her sequel to Dark Hope, which she hopes to publish soon. Despite having just turned 27 years old, I must confess that I still love reading young adult fiction. Perhaps it's because it's easier to find novels that aren't too 'mature' a subject, or perhaps I'm just young at heart. Whatever the reason, I still love them. Paranormal fiction has always been a particular favorite of mine as well. I'll admit it- I read and enjoyed every single Twilight book! So when I saw that this was a paranormal fiction written by an author who began as a Twilight fan fiction writer, I was intrigued and couldn't wait to dive into the story. The first thing I noticed about the novel was that, though written and marketed as a young adult novel, it truly did not seem to be so. The main character may be a teenager, but the book deals with some mature themes like human trafficking. Though not inappropriate for an older teen audience, it is certainly something to consider before letting a younger teen read. Still, the story was told wonderfully. Not only was there this great paranormal story, but it also shed light on this very real, very human issue as well. (In fact, a portion of sales from the book support the cause...you can read more about this on Monica's Website.) These two worlds were woven together beautifully to draw the reader in...normally, I cannot say that I'd want to read a novel on human trafficking but with everything else in the story, it drew me in anyway. What a great way to educate readers on such an important topic! Now, I don't want to give too much away, but I will say this is a great read with a little bit of everything... a great, unique story line, real issues, fantasy, a little romance, drama, action, adventure, mystery...it's all there. If you're anti-Twilight, you might be hesitant to read knowing how the author started, but they could not be more different! If I were to have to compare it to anything, I'd lean more towards Supernatural...but even then it's still completely unique. If there's one area of paranormal type themes that I'm a little iffy about, it's probably angels...they can sometimes be a little cheesy or just...boring, I suppose...but that's certainly not the case here! To be honest, the worst part about this book was the ending...not because it was poorly executed but because I wanted MORE! Being Book One, there were many more secrets left to be uncovered and mysteries to be solved! What happens next!? I'm dying to know! I will be waiting (im)patiently for the next installment!! Want to keep up with Monica McGurk? If you'd like to learn more, or purchase your own copy, you can do so here. And one very lucky reader is going to win a copy of their own! We're going to keep this one very simple- just one easy entry!! Good luck! !